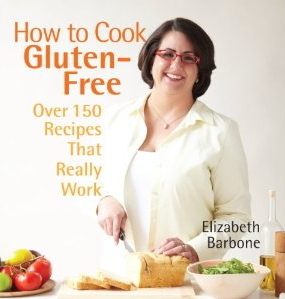 When Elizabeth Barbone contacted me to see if I wanted to help promote her new book How to Cook Gluten Free, I was more than happy to jump on her bandwagon. I first "met" Elizabeth at Serious Eats where her gluten-free cooking column was running on the same day as my bread-baking column. Opposite ends of the spectrum, huh? I've never met Elizabeth in person, but I'm just a teeny bit concerned that if we ever do meet, we may cause a black hole to form as super-gluten and anti-gluten collide. Seriously, though, I'm massively impressed with Elizabeth. A lot of people think my bread recipes are amazing, but Elizabeth does the same thing without using any gluten. It's like working with one hand tied behind your back. And blindfolded. On Serious Eats, she didn't settle for making things that were sub-par gluten-free substitutes for real food - whatever she made looked fantastic. And she didn't cheat. You wouldn't see her making a salad and saying, "oh, look, this is gluten free!" She made difficult things. Like beautiful biscuits. So, of course I was happy to try out a recipe and write about it. In a medium bowl, whisk together the dry ingredients. In a small bowl, mix together the wet ingredients with a fork or small whisk until combined. Pour the wet ingredients over the dry. Using a wooden spoon, stir to combine until a dough forms. The dough will be on the dry side. This is normal. Generously sprinkle your counter with the white rice flour. Turn the dough out onto the counter. Knead the dough until it is smooth. 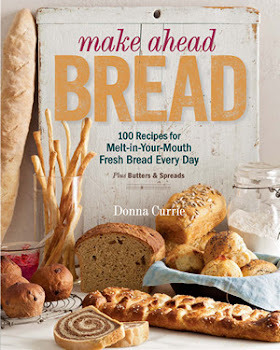 If, after, kneading for a minute, the dough is still dry and doesn't hold together, add a tablespoon more water. Center the dough on a 16 1/2 by 12 1/2-inch piece of parchment paper. Dust the dough generously with white rice flour. Roll out the dough until it covers the parchment paper. Set a rimmed baking sheet very close to the rolled out crust. Grab the corners of one of the long sides of the parchment paper and slide the crust into the pan. Do this quickly. Top and bake as directed in the recipe. We were also given a recipe for what looked like a really good pizza with roasted tomatoes and artichoke hearts. I decided to do something much more simple - tomato sauce, provolone cheese, and black olives. The instructions said to brush the crust with olive oil and then bake at 425 degrees for 15 to 18 minutes until it was lightly golden brown. I followed that, but then added my own toppings. When the crust was in the oven, I warned my husband that we were having a gluten-free pizza. You know, just in case he wanted to run away. Seriously, I've tried some gluten free pizzas that were terrible. One was completely inedible. Gummy, doughy, and with a chemical-like flavor that couldn't be overcome. This pizza was the opposite - a very crisp crust, almost cracker-like on the edges. Under the toppings, the crust was a bit more tender. It wasn't exactly like any wheat-crust pizza I've ever had, but it was completely edible. It's what we had for dinner - no Plan B required. Well, the toppings could have been a little more creative. But it was all about the crust, anyway. And that was a success. Of course, that's what I expected from Elizabeth.